When I was a little girl, my father often went antiquing for suits of armor. I loved to go along with him, but sometimes I grew restless. Once, he spotted a jar of buttons and asked me to sit quietly and count all of the buttons in the jar while he browsed through the shop. Counting every button, one by one, kept me occupied. 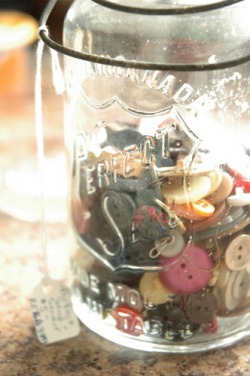 From that day on, it was my job to count the buttons in jars at every antique store we visited. When it was time to leave, he’d usually say, ”You were a good girl.” But one fine day, he purchased an entire jar of buttons for me! Thus began my enduring love affair with buttons. Many years later, I was asked to participate in an exhibit called “Hello Again” for the Oakland Museum in which all designers used recycled materials. Combining my silver-smithing skills, my love for jewelry, and my passion for buttons, I designed a ring using a vintage button as the centerpiece. That was the birth of Cute as a Button–my line of handcrafted, button-centered rings, earrings, and pendants. All of my pieces are bezel set in sterling silver, but I can plate them in 22-karat gold or rose gold. I only work with old and rare buttons, and occasionally with cufflinks. I showcased my wearable works of historical art in a caboose called Successories in Pacifica for 16 years. For the past couple of years, I’ve rented space at different retail venues in San Francisco, so I’m delighted to have my very own store at 3904 24th Street in Noe Valley. One of my favorite things to do is custom-make jewelry using other people’s buttons. Last year, a woman commissioned me to make pendants using the 1930s brass buttons from her late grandfather, who had been a firefighter. The pendants were given to family members, who now wear them in his remembrance and honor. I felt truly honored to be a part of this sentimental act. I look forward to seeing you at the shop in San Francisco or in our virtual shop!